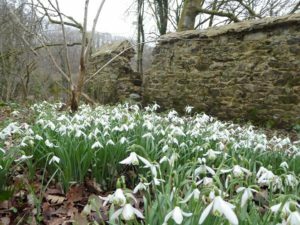 In the last post we were talking about NGS Open Gardens some of which are opening in February because they have large numbers of snowdrops. Yesterday we stumbled on a walk which is one of the best we have ever done for enjoying snowdrops. 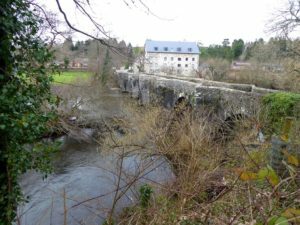 We did a circular walk from Dartington hall, taking in Staverton along the way. Very pleasant walk, long stretches by the river Dart but also turned out to have stunning displays of snowdrops for a large part of the route. Staverton is worth the detour: an impressive medieval bridge, a steam train station, and a refreshments at the lovely Sea Trout Inn.